Police cars need to be reliable, fast, sturdy and spacious both for door-breaking equipment and for, ahem, passengers. 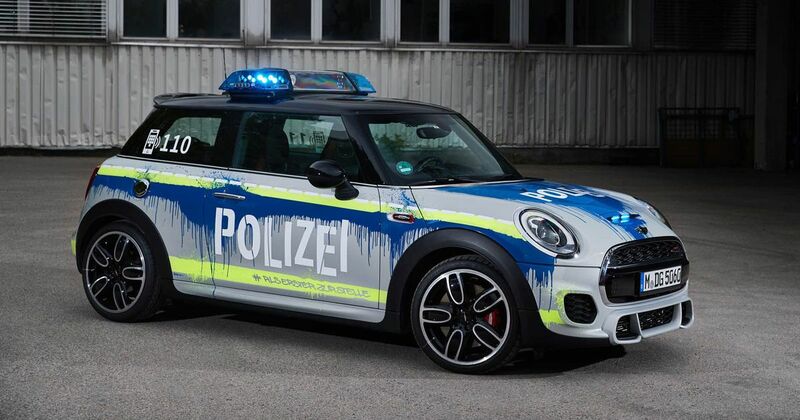 We’re not sure this cool Mini concept quite meets all of those criteria, but we like it anyway. 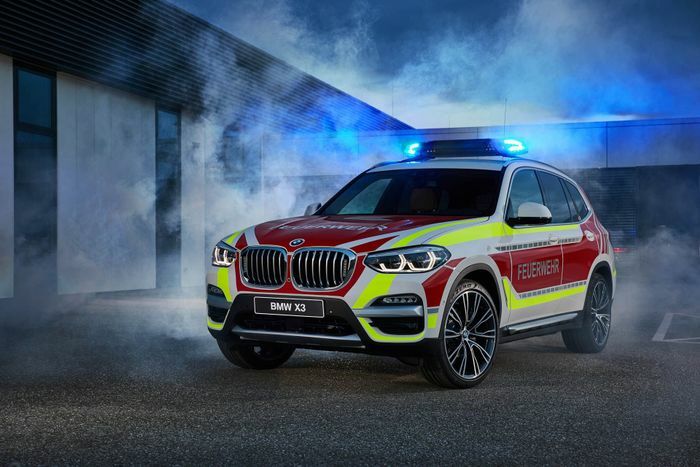 It was one of the highlights of BMW’s stand at the RETTmobil expo, Europe’s biggest exhibition of emergency service vehicles and hosted in the central German city of Fulda. Based on a John Cooper Works version of the evergreen hatchback, it certainly ticks the speed and sturdiness boxes. 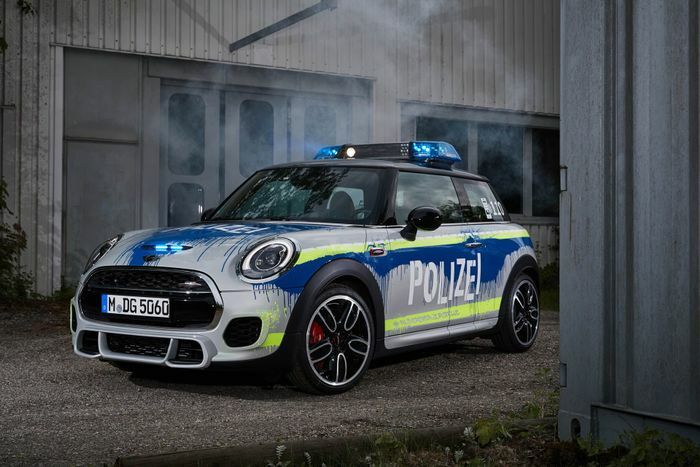 The dinky polizei-wagen can race to 62mph in 6.3 seconds as a manual, or in 6.1 seconds with the slick-shifting automatic. 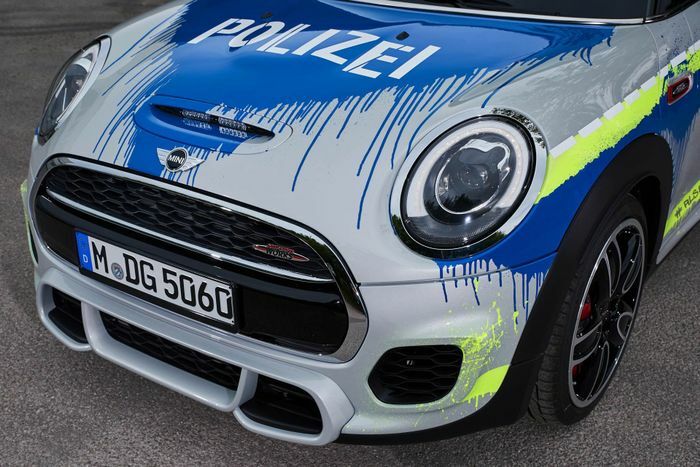 This 228bhp pocket rocket has apparently been decorated by the force’s resident graffiti artist. Blue swathes down the sides and bonnet have dozens of ‘paint runs’ for effect, with yellow contrasting accents for a funky take on traditional police colours. Since the Cooper S and John Cooper Works Minis went turbocharged for the 2007 model year the bonnet intake has been for display only, but here it has been commandeered for a couple of blue LED light strips that sync with the main roof-mounted blue strobe lights. Also on display at RETTmobil was an X3-based fire department car. Sadly there are no novelty hoses or bizarre roof-mounted water tanks, but this fast-response and reconnaissance car still looks neat.